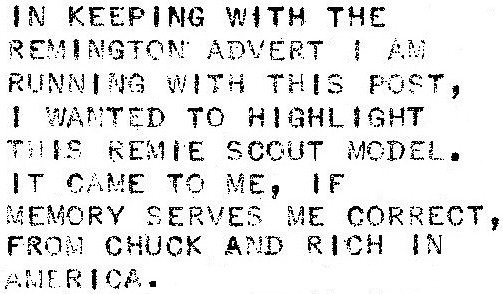 The Royal Signet aside, no typewriter better represents what has been referred to as "Depression Era Typewriters" than the Remie Scout. Naturally, however, Remington didn't mention the word "Depression" in its advertisement. 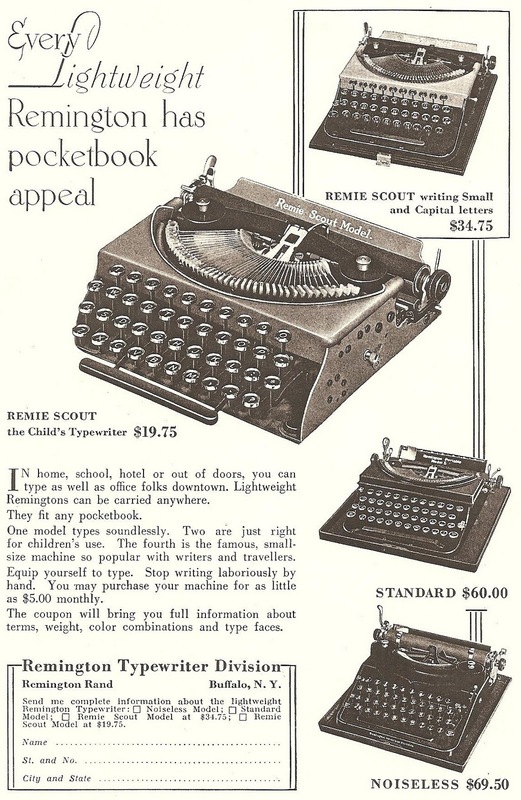 It called the Remie Scout "the Child's Typewriter". Two of the advertised models (the highlighted frontless Remie Scout and the Remie Scout with an enclosed keyboard and upper and lower case letters) were described as "just right for children's use". Talk about the Blick 5 being stripped back to the bare basics: the Remie Scout was literally pared to the bone! It is certainly a fascinating machine. 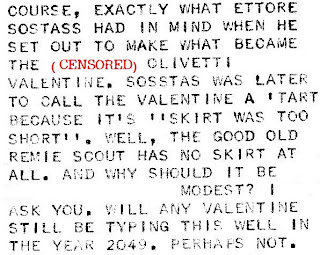 And there can be no question it was still fascinating Ettore Sottsass when, in the mid to late 1960s, Sottsass dreamed a dream of a "People's Typewriter". This is precisely what he had in mind - the typewrite equivalent of a Bic biro. 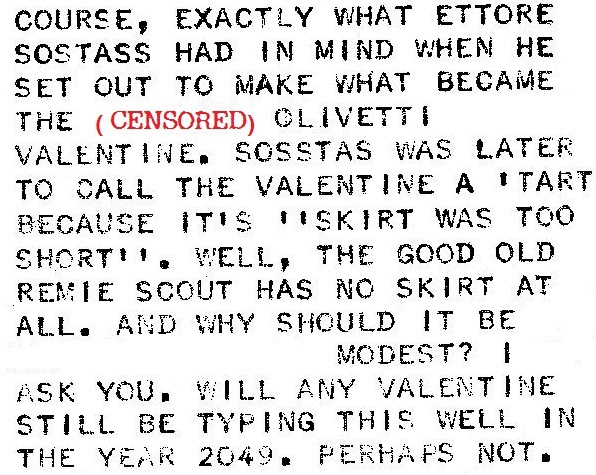 But Olivetti didn't share his vision, and turned his concept into the Valentine. I will look at the Remington Portable Model 5 and the Noiseless mentioned in this ad in later posts. In the meantime, let's look at an earlier model, the Remington No 4, which came to me in a rather unexpected manner. 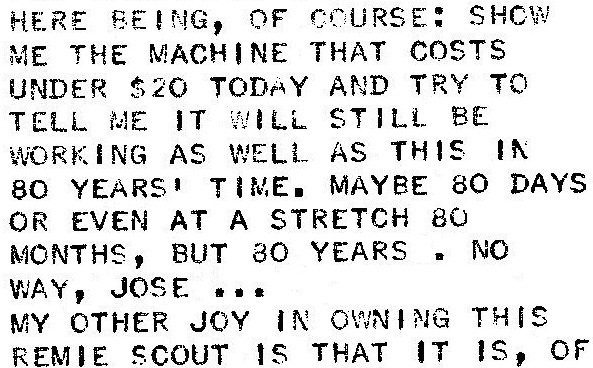 Richard Polt says only 2882 of these were ever made, almost all in a two-month period between November 1931 and January 1932. Richard adds, "This is like the No 3, but has a true tabulator instead of a paragraph (five-space) key. It cost $65, $5 more than the No 3." 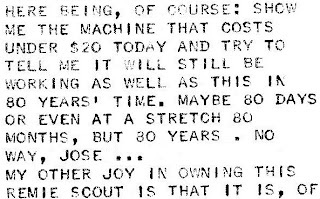 That truly is an amazingly cheap typewriter: $19.75 is today $343. For that price, you might find a Netbook computer, but I have doubts whether it will still work in the year 2092. And it's not a typewriter. A Hermes Baby, by the way, did cost 160 CHF in 1936, today, that's 1275 CHF or $1355. Some of the worst typewriters I have ever used have been bad because of disuse--I had to change all of the rubber in a beautiful 1927 Royal, because it had flattened. It probably works better since it was used so late.